5. 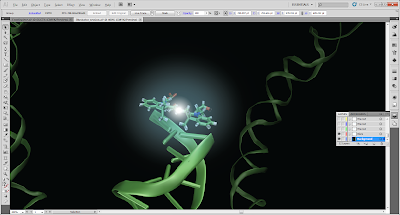 Add glare using Adobe Illustrator - The fluorescence laboratory. 1. Load the bitmap file produced by POV-Ray into a new Adobe Illustrator (ai) session. 2. Go to the Layers panel and rename the current layer to Background. 3. Make a new layer from top right corner of the Layers panel and name it Glare. 4. Select the Ellipse Tool from the toolbar. 5. Pick a dye color color scale from the swatches menu. Here CMYK Cyan was used. 6. From the Color menu, set the color whiter. Here cyan was set to 50%. Draw a circle on top of the dye using the selected ellipse tool. Set the Opacity to 50%. 7. 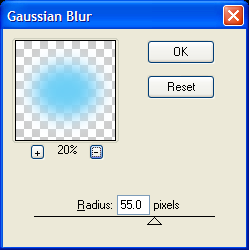 Go to Effect -> Blur -> Gaussian Blur. 8. Set a proper radius. Here 55 pixels was used. 9. Now get that intense white color in the middle of the glare. First make a transparent circle somewhere within the Glare-layer using the ellipse tool. Set its size to 1.05x1.05 and its opacity to 0%. 10. Make a new, smaller, white circle with size 0.175x0.175 and opacity 100%. 11. Select both new circles and align them so their centers are in the same point. Then go to Object -> Blend -> Make. 12. Finally, position the new blended circles in the center of the dye. 13. Repeat step 5-12 for the other dyes. Set a new color for each of them but keep the bright center white.